It was 50 years ago today that my beautiful mum and rather cool looking dad walked down the aisle together. 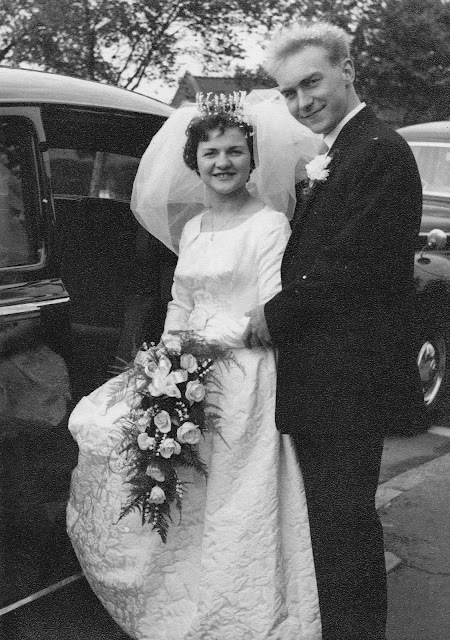 Since mum's stroke two years ago I have wondered if we would get to this day and although it may be a somewhat different day to what we all expected, it is here, and I can honestly say they are both still so, so much in love and I just want to wish them a very, very happy 50th Wedding Anniversary. Checking Amazon.co.uk yesterday I was surprised to see that A Stitch in Time V:2 is showing as available but with delivery in approx 4 weeks. The book is definitely not available yet and I'm really not sure why amazon is showing it in this way. The approximate delivery date of 4 weeks makes sense but if you order from Amazon expecting the book to arrive immediately I'm afraid you won't receive it. I do hope this hasn't caused anyone too much disappointment or confusion. Pre-order despatch will be our number one priority once the book is published so hopefully no one will be kept waiting once it is available.